While a student at Montana State University, multimedia artist Wendy Red Star learned that her tribe, the Apsáalooke (Crow), used to own the land that the college sat on -- at which point, Red Star decided to set up tepee poles around the campus, finishing by erecting five of them on the school's football field. And it's projects like this -- combining her research on Native Americans and her own experiences growing up on the Crow Indian Reservation -- that have defined Red Star's practice, researching and creating at her home in Portland, Oregon. Her work, which ranges from photography to sculpture, has been exhibited at the Metropolitan Museum of Art, Fondation Cartier pour l'Art Contemporain and the Portland Art Museum. We spoke with Red Star about the state of contemporary Native American art, the importance of incorporating herself in her work and how her 9-year-old daughter, Beatrice Red Star Fletcher, became her artistic collaborator. Research plays a large role in your process, but has understanding the history of the Crow people always been important to you? Being half white and Crow and having my mom's side all live in Colorado, as a kid, I remember leaving the reservation and going to visit them. I would note the differences. But when I'm on the reservation, the houses are this way, and there are just certain things that don't matter, like the concept of yards. But then we have this deep, rich cultural experience that I've never ever had when I go and visit my white side. To see how poor my Red Star side was until just maybe five years ago, and I was thinking about my aunts and uncles and (thought) "wait a minute, they've never really had jobs. They're kind of on welfare, but it's like a reservation welfare." I don't even know how they do it, but it's never felt poor to me. That was just how it was. It's an interesting thing that's really kind of shaped me where you use whatever means you can to make things happen, but your culture blows everything away. What are some of things you have been inspired by recently? For me, I'm still interested in historic photos. When you walk into any Native gallery in a museum, the historic stuff, almost all of it -- except maybe Southwest with the pottery and stuff like that — people think about warriors and chiefs. They never think about Native women, and the women are the majority — almost 90% of the makers of the objects — but you're still thinking about men. I'm in the process of taking historic photos of Crow women, and I'm trying to find ones of them that are full-body. Then I'm blowing them up into life-size cutouts. I just want to create this army of women. The other thing that I'm participating in, and it's something that my whole family has done, is Crow Fair. It happens every third week in August, and it's a magical time where the whole Crow tribe camps together and every family has their own camp, and they set up tepees. It is known as the tepee capital of the world. Along with that, we parade on horseback and cars, and we dress up in our regalia, and that represents us moving to a different camp, like we did historically. It's really beautiful, and then there is a powwow that happens, and they mix in a rodeo. So when I was a teenager, I was a princess. They have Crow Fair princesses and my uncle, Clive Dust, made this life-size war bonnet out of cardboard feathers. It was just amazing. His Crow name — everybody has a Crow name — was Always Creative. So I remember we had the war bonnet on the flatbed, and I sat kind of in it. I remember that the whole family was really uplifted by his creativity. So what I want to do is recreate that and try to parade with that, and that will be in an exhibition. But the idea is to have these historic women, have cut-outs of them, surrounding the war bonnet. And I'm making a bunch of Pendleton suits. Pendleton has an interesting history for the majority of Native people and for my tribe particularly. 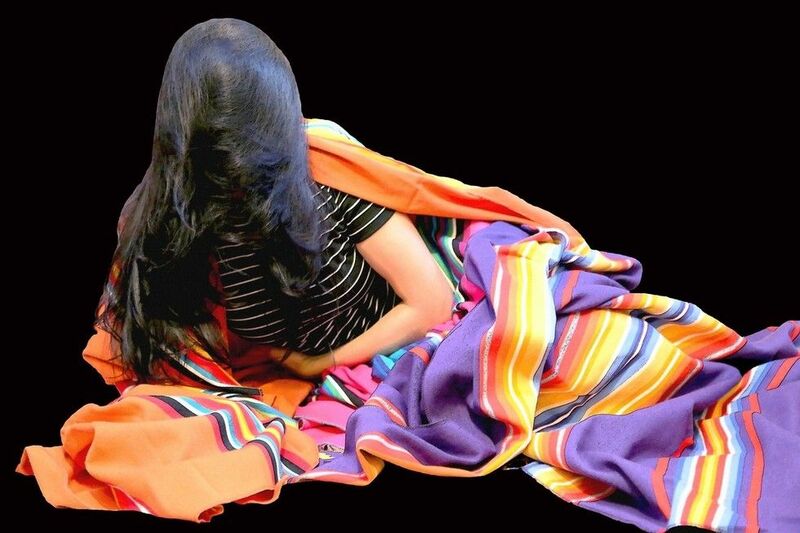 Of course, blankets go back to the trading system and fur trade. You will find pictures of girls with Pendleton blankets, and no one takes the tags off. If you take a tag off, you can just throw the blanket in the trash because it doesn't mean anything, and the blankets aren't used to put on your bed. They are used for parading or to honor somebody. So for me, to make a Pendleton suit is like a Prada suit or something. So I'm deep in the process of doing that, but I'm also referencing Joseph Beuy's felt suit. So I'm also referencing contemporary art, but with my own versions of the suits. I'm not quiet sure how those will be displayed yet, but I also want to make a little suit for my daughter Beatrice so we can powerhouse around together in our suits. You do a lot of collaborations with your daughter Beatrice Red Star Fletcher. How have those evolved and how have they changed your art? It's kind of like that cliché moment when you're like "Oh everything makes sense now." She has totally changed my practice. So it was just kind of a fluke when I was doing a solo show at the Portland Art Museum in 2014, and I had a bunch of Xeroxed copies of chiefs, and I was working on them and she wanted to interact. I thought, "I really have to get this done," but I just handed her a stack of chiefs and then forgot about it. She came back out, and she had done these incredible drawings over the tops of them. I thought, "Wait a minute. You can be a part of this." There's a pressure for parents in any job that you are doing that your kid isn't allowed. You find a babysitter or whatever. I was thinking I'm not going to let this happen in my art practice. It's really a conversation, and she'll say if she wants to do it or not. The scary part about working with your kid is that being an artist, you put yourself out there. Putting yourself out there, you allow people to have their opinions and criticize. For me, I'm very much in tune with that. I want to be protective of her of that. The other thing is I have no idea how long this will last. She has turned 9 and I can tell she has changed. Why is it important for you to incorporate yourself in the art you do, given the history of Native Americans being photographed by people like Edward Curtis? It's pretty simple. It's just that I'm very antisocial. No. [Laughs.] I am a hermit. I really like to be at home. I don't know any Crow people around here. The other thing is I actually really hate getting my photo taken. So when I'm taking the photos, I'm by myself, and I can make the ugliest faces and just put myself out there. It is more like a control thing. It's a comfort thing. There is a giant thing about being appropriated. I just heard somebody say white people make the greatest Indians. People are always telling us what we should be or how we should look or how authentic we should be. It's empowering for me to put my own imagery out there of my perspective for a change where the Edward Curtis photos, even though his subjects are Native, that's his perspective totally. 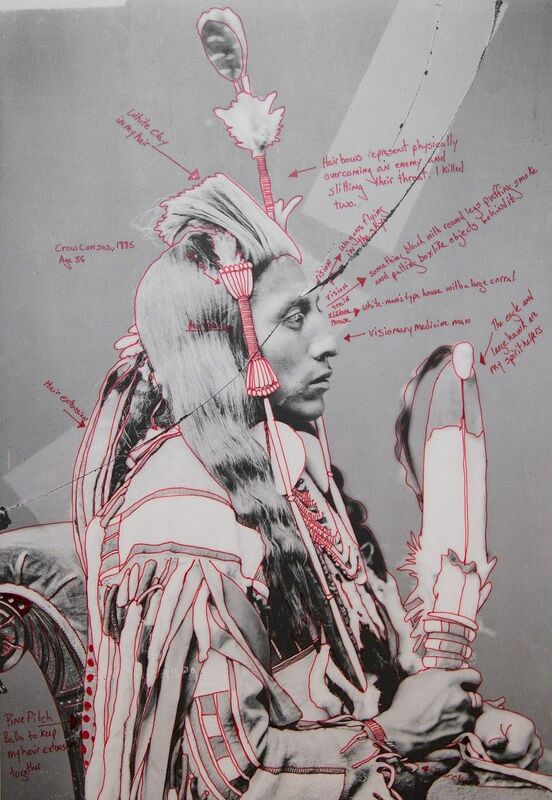 Do you think museums are changing now and there is a growing appreciation for contemporary Native American art? Well there is a long way left to go, especially for Native women artists. There has been some crossovers with men. For instance Brian Jungen. He's on Art21, and he has shown at the Tate Modern, and he has really kind of broken through. But as far as Native women, I think Rebecca Belmore in Canada. Canadians, those are both Canadian artists, have done better as far as being included in the mainstream art world, but here in the States, we really haven't made much headway. But I think museums now, they know their collections are problematic, and they know that that's the voice that's missing. We are kind of the last voice, and we are kind of the zero percent. It's like here is this perspective that we need to try to include, and I think people are like "Wait a minute. 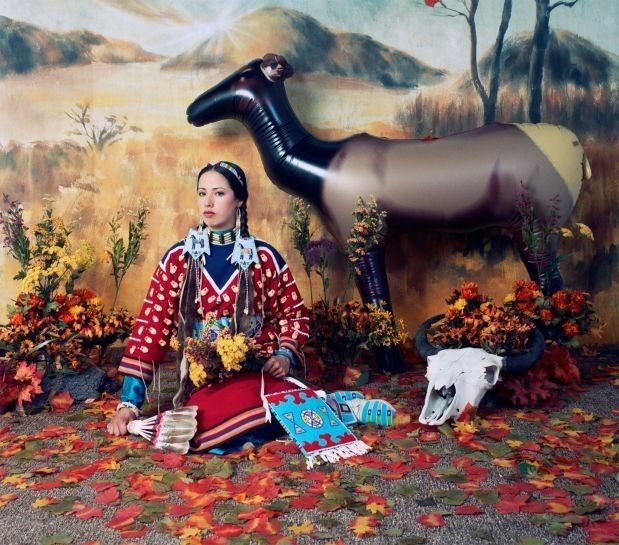 There are a set of native artists out there that are doing important things." But it takes the right curators and the right people to recognize that and to want to be inclusive. I think it's starting. I can feel it just within my own career. I can see and I can feel it in a lot of the museums. I do identity-based artwork. You've got other Native artists who are not doing anything that deals with their identity, which is fine. But for me, I think that museums, what they like is that I do want to interact with the Native collections. It is important to me. That's where I gain my own inspiration and I think that's where it's intriguing to them because of what I said: there's a problem within their own collection. How do you use social media as an artist? For me, I found Instagram (@wendyredstar) to be one of my favorite platforms. It's kind of like a miniature gallery for me where I can compose and show what I want, which I think a lot of people do. And then I created a hashtag called #apsáalookefeminist. I'm really interested in the feminist movement, but again, I feel it leaves out a lot of people of color as well. That's why I created #apsáalookefeminist. When you click on that hashtag, it shows you a world of what that is to me. That's also an interesting thing about Instagram in that that you can create your own hashtag and link it. So now I have this whole page of this person, and I want to kind of flesh out that person. How would you define the #apsáalookefeminist? Well there's definitely a Crow aesthetic about that person as a way a Crow woman acts. And that has to do with dress but also having to do with personality. I think speaking as a Native woman in the art world, it's kind of forging the path forward. Really, I'm hoping to continue to progress and go as far as I can, and that's who #apsáalookefeminist is. So I'm breaking ground and being very strategic and careful with how I go about doing that. So I would say she is a path breaker. Red Star has shows at the Hap Gallery in Portland, Oregon from July 14-August 28 and at the Triton Museum of Art in Santa Clara, California from August 27-October 30.